The final church of the seven, Laodicea, has a pretty discouraging report card. It is described as nauseating. It thinks well of itself while it is actually “wretched, miserable, poor, blind and naked." We could call it a church in denial. It is the only church to which Jesus gives no commendation at all. 1. The Ephesus church represents the church at the close of the first century. 2. The Smyrna church represents the church from the beginning of the 2nd century until Constantine (beginning of the 4th century). 3. The Pergamos church is the church of the 4th through 7th centuries. 4. The Thyratira church is the church of the Middle Ages. 5. The Sardis church represents the church just prior to the Protestant Reformation. 6. the Philadelphia church represents the “true church” throughout all of church history, especially the segment that experiences revival prior to the last days. 7. The Laodicea church represents the church in its final days, prior to its pretribulation rapture. It is characterized by apostasy. Many Bible teachers feel we’re living in those last days. If we look at current events and line them up with Bible predictions, it’s easy to agree. On many fronts the modern church has fallen into apostasy. Does that mean we’re doomed to capitulate to the same thing ourselves? No. Because in the end, it is not as a group that we respond to Jesus but individually. That’s why Revelation 3:20 is one of my favorite verses. Jesus comes to me (and you). 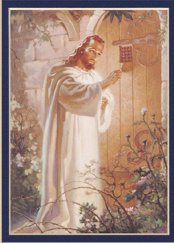 He knocks on the door of our hearts. He wants to spend time with us, eat with us. As those of us who have welcomed Him into our lives join together, we will continue as a church that delights Him. PRAYER: Dear Jesus, come in! Make Yourself at home. Let’s visit, eat together, and live together. Please make Your home in my heart. Amen. * E. A. Morey, in the study notes to Revelation, New Spirit-Filled Life Bible, pp. 1818-1822.